These Gold Hotel Rules & Regulations (hereinafter: Regulations) shall define the rules for providing hotel services by Gold Hotel located at ul. 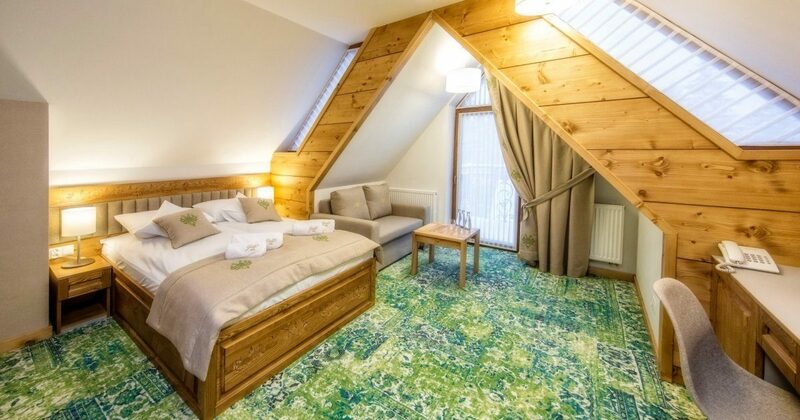 Oswalda Balzera 35 in Zakopane (hereinafter: Hotel) as well as rights and obligations of Hotel Guests, and shall constitute an integral part of the agreement concluded by making a booking, paying an advance or total fee for your stay at the Hotel, or by signing a registration card. By making any form of room booking at the Hotel, you confirm you have read, understood and accepted these Regulations. These Regulations shall apply to all Guests staying on the Hotel premises. These Regulations shall be available at the Hotel Reception Desk, every hotel room and at the Hotel’s website: www.goldhotel.eu. All hotel rooms are rented for so-called hotel nights or other duration individually agreed with you upon a separate agreement. A hotel night starts at 3.00 p.m. (check-in) and ends at 11:00 a.m. (check-out) on the following day. You may notify the Hotel Reception Desk of your intent to continue your stay at the hotel room, however, no later than one hour before the check-out time. The Hotel may not be able to accept your intent to stay in your previous rooms if it had been booked earlier, however, in order to enable you to continue your stay at the Hotel, the Hotel may offer you to stay in another room that will be rented at a fee applicable on that given date. If there are no vacant rooms at the Hotel or if you fail to comply with these Regulations, the Hotel shall have the right to refuse to provide you with further accommodation. The Hotel shall also reserve the right to prolong your accommodation at the Hotel if you fail to fully pay for your previous stay. If you did not specify the duration of your stay when booking the room, it shall be assumed that you booked the room for one hotel night. W przypadku udzielenia zgody na przetwarzanie w celach marketingowych dodatkowo przysługuje Pani/Panu prawo wycofania udzielonej zgody w dowolnym momencie, żądania ograniczenia ich przetwarzania, usunięcia, oraz prawo do bycia zapomnianym. The total fee for your stay at the Hotel is paid in advance before you receive keys to your room. Failure to pay the entire fee for the room on your arrival date shall mean withdrawal from the room rental attributable to you and the Hotel may keep the entire advance payment as compensation for lost income. You will be registered by a Hotel Reception Desk employee based on your identification document with a photo and legibly completed and signed registration card. If you refuse to present your identification document, the Hotel shall have the right to refuse to register you as a Guest. In exceptional situations, you may be registered by the Hotel without the need to present your identification document, however, you will be required to pay for your room and any services provided at the Hotel in advance, before you use such services. You shall not have the right to make your Hotel room available to third parties who are not registered at the Hotel room without the Hotel’s consent, even if the period for which the hotel fee was paid did not expire. Individuals who are not registered at the Hotel may visit you at your hotel room between 8.00 a.m. and 10.00 p.m. and must comply with these Regulations. The Hotel shall also reserve the right to refuse to accept a Guest who had severely violated these Hotel Regulations during his or her previous stay, by causing damage to Hotel property or to other guests, employees or other persons present at the Hotel, or otherwise caused a disturbance to a peaceful stay of other guests or to Hotel operations. Animals are strictly prohibited from the Hotel. The Hotel is a three-star facility and provides services consistent with such category and standard. necessary repairs of devices in hotel rooms during your absence or in your presence solely upon your consent. Valuable items upon declaring their value and cash up to PLN 2,000 may be kept in the Hotel deposit located at the Reception Desk. The Hotel shall be liable for the loss or damage of any items brought in by you in accordance with the provisions of the Civil Code. The Hotel parking lot is free to use for Hotel Guests. The parking lot is not guarded. The Hotel shall not be liable for vehicle damage or loss to cars or other vehicles left in the parking lot. Any complaints regarding services provided by the Hotel must be notified immediately at the Reception Desk. Hotel staff are obliged to improve the standard of services provided if deviations from the Hotel standard are found. Individuals without full legal capacity should be continuously supervised on the Hotel premises by their legal guardians or persons to whom such legal guardians granted custody over such individuals during their stay at the Hotel – such guardians and persons shall be liable for any damages caused by the individuals under their custody. You should notify the Hotel’s Reception Desk as soon as you notice or cause any damage. You shall be financially liable for any damages and destruction of items or technical equipment of the Hotel caused by you or your visitors. If you fail to notify any damage or destruction at departure or fail to disclose the fact, the Hotel shall reserve the right to charge your credit card up to the value of such damage or to demand that it is redressed on general terms. It shall be prohibited to take any skis, ski boots and other skiing equipment into Hotel rooms as well as to walk in your ski boots and other sports footwear (e.g. football cleats) around the Hotel. The Hotel provides a special separate room where you can keep any skiing and other sports equipment. It shall be prohibited to smoke tobacco, e-cigarettes or any other stimulants in all Hotel rooms and common spaces of the Hotel. Any breach of such prohibition by you or a third party may be subject to a contractual penalty of PLN 500 by the Hotel staff for every such breach. The Hotel has provided specially separated smoking areas. It shall be prohibited on Hotel premises, and in Hotel rooms in particular, to use water heaters, electric irons and other similar appliances that are not provided by the Hotel, or to use open fire. If you set off an unjustified fire alarm, you will bear full criminal and financial liability for fire brigade and other rescue services’ intervention. You must comply with the quiet hours of the Hotel between 10.00 p.m. and 7.00 a.m. You and other persons using Hotel services must respect the quiet hours. If you breach any of the provisions of these Regulations, the Hotel may refuse to provide you with any further services. In such an event you shall immediately comply with the Hotel demands, and in particular you shall pay for the previously rendered services, compensate for the damage caused and shall leave the Hotel immediately. Every time you leave the room, you should turn off all electric and electronic appliances, turn off the lights, close taps and check if the door is locked for safety reasons. As a security for services provided to you by the Hotel and for claims to reimburse expenses for you, the Hotel shall have a statutory lien on items brought to the Hotel by you. The right shall be subject to the provisions on lien interests of the lessor. Any items you leave at the Hotel upon departure shall be sent at your expense to the address you indicate. If the Hotel does not receive such instructions from you, it shall keep the said items at your expense for one month. Failure to collect such items within such period shall be considered as disposal of ownership in the meaning of Article 180 of the Civil Code. Foodstuffs, due to their properties, shall be kept for 24 hours. You shall have the right to lodge a complaint if you notice deviations in the quality of services performed, and to decide to cease using the Hotel’s services. Such complaint should be lodged in writing immediately after you notice deviations to the quality of the services performed. Reception Desk staff shall not be authorised to reimburse any funds. Complaints shall be reviewed immediately, however, no later than within 30 days from their submission. No hazardous goods, guns and ammunition, flammable, explosive or illuminating materials may be kept at Hotel rooms. The personal data is processed for the purpose of booking accommodations and providing hotel services, and in the event of consent having been given, also for marketing purposes. The data collected for the purpose of providing hotel services will be processed for the period of time defined by legal regulations and in the event of data collected based on a consent, until the consent is revoked. You have the right to access the data, as well as to data correction, data portability, and the right to receive a copy of the personal data processed by the hotel. In case of having expressed consent to the processing of data for marketing purposes, you additionally have the right to revoke the given consent at any point in time, demand the limiting of its processing, erasure and the right to be forgotten. - companies providing marketing services for the hotel. In case of finding that personal data is processed unlawfully, you have the right to file a complaint with the President of the Personal Data Protection Authority (Prezes Urzędu Ochrony Danych Osobowych). The hotel is equipped with a visual monitoring system. The purpose of the monitoring system is to enhance the security of hotel guests. The data collected by the monitoring system is retained for 90 days. The data collected by the monitoring system can be made available to applicable authority upon their request. Any solicitation, door-to-door sales and gambling activity shall be strictly prohibited at the Hotel. Apart from slight movement of furniture and equipment which does not impair their functionality and safe use, you may not perform any modifications to the rooms and room equipment. The Hotel offers a children’s area aimed for play and leisure. The Hotel shall not be responsible for children who stay at such area. It is recommended that you supervise your children. You as the guardian of your child shall be liable for any damage caused by the child during his or her stay at the children’s area. There are separate Regulations concerning the use of the Sauna Lounge and Booking Regulations. These Regulations shall enter into force on 23 December 2016 and may be amended unilaterally anytime by the Hotel.